The oceans can be a noisy place filled with boats and an increasing number of wind farms. The animals who call the sea home have had to adapt to the increased sounds. Researchers found that bottlenose dolphins in the Atlantic ocean off the coast of Maryland were simplifying the calls that they use to identify one another. Their results were published in the journal Biology Letters. Marine biologist Helen Bailey, who was an author on that study, talks about the benefits and costs that these adaptations have on the health of these dolphins. Find out more from the full study published in Biology Letters. Read a version of this story on Quartz. Learn more about Bailey’s work from the original press release. Helen Bailey is a research associate professor at Chesapeake Biological Laboratory. IRA FLATOW: Now it’s time to play good thing bad thing because every story has a flip side. The ocean can be a noisy place. And when you consider all those motorboat engines adding to all the sounds of life below the surface– So how do ocean animals adapt to this increase in volume? 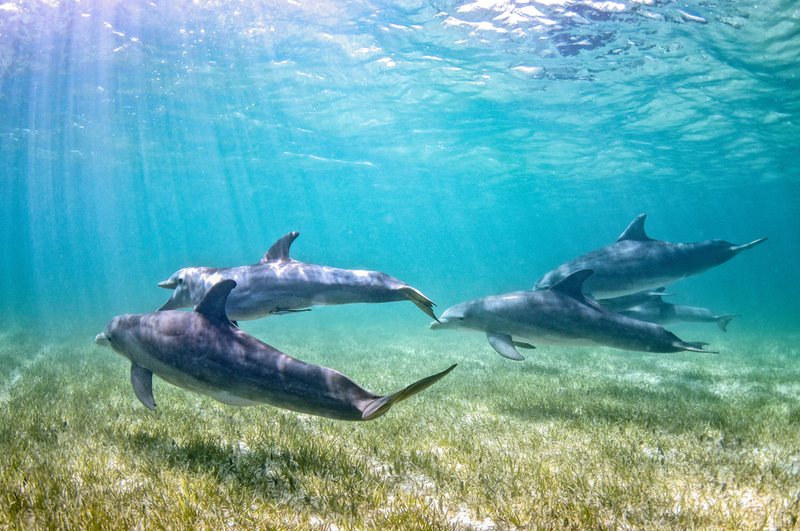 Researchers found that bottlenose dolphins off the coast of Maryland are actually changing how they speak to each other, their calls, making their whistles simpler to be heard better through this background noise. Their findings were published in the journal Biology Letters. And here with the good and bad about that is Helen Bailey, an author on that study and also research associate professor at Chesapeake Biological Lab in Solomons, Maryland. Welcome to Science Friday. HELEN BAILEY: Hi. It’s great to be here. IRA FLATOW: So the bottlenose dolphins are simplifying their calls? HELEN BAILEY: They are. So just like us if we go to a noisy bar– If you’re trying to talk to someone you have to usually get closer. And someone asks you something like, oh, where are your keys? And you say, yes, they’re in my pocket. And you’re there like what, what. And you just start yelling yes. You just simplify what you say so that they can hear you better. And that’s what these dolphins are dealing with. They’re like in a noisy bar under the ocean. IRA FLATOW: I’ll bet you. We have a clip of dolphin whistles that you collected. And basically, it’s a double clip. First, we’re going to hear at the beginning, just the dolphin calls. And then, you’ll hear a change when the dolphin’s calling with boats in the background, give you an idea of what it sounds like. IRA FLATOW: Wow. I can see why the calls have to be simpler. If they are simpler, does that mean there’s less information in those whistles? Are they communicating less efficiently? HELEN BAILEY: They certainly do talk to each other a lot. They’re very social animals. They’re producing these whistles all the time to talk to each other. So they’re really important. And yet, as you can hear, with all that background noise it’s very difficult to communicate. And we’re concerned perhaps that could have implications for the group and particularly for things like mother-calf pairs who are trying to stay in contact. IRA FLATOW: If I were in the middle of all that noise, and we all have our own street noise here as humans, it could be very stressful. Do we know if the dolphins are getting stressed by this noise? HELEN BAILEY: They could well be. There was another study a few years ago, after the 9/11 event, showing that white whales were less stressed after the events because there was lower boat traffic, it was quieter. And the animals were less stressed. So it’s very likely that the dolphins experience that too. Just like we don’t like living in a noisy neighborhood, it may be stressful for them as well. IRA FLATOW: And do they change their behavior, then, because of all this noise? HELEN BAILEY: These hydrophones that we have are these underwater listening devices. So we knew that the dolphins were calling even when there was loud background noise. And it was only when we looked in more detail that we saw these changes in the calls. And so what we want to do next is look at specific types of whistles, those that we call signature whistles, which are like their names. They call out to each other. They say who each other is. And also their feeding behavior, to see if any of that is changing when we have this background noise. IRA FLATOW: So is that what you’re going to be looking at next? HELEN BAILEY: It certainly is, yes. Because at the moment, we can tell– The good news is the dolphins do seem to be adapting. The fact that they can compensate for this background noise is good. But the trouble is, when you have a lot of noise 24/7, is that going to start to be detrimental to their health and their ability to feed? So that’s what we went to look at next. IRA FLATOW: That is the good news and the bad news. Thank you, Dr. Bailey. HELEN BAILEY: Thank you very much. IRA FLATOW: Good luck with your research. Helen Bailey, research associate professor, Chesapeake Biological Laboratory. That’s in Solomons, Maryland. We’re going to take a break. And after the break we want to know what’s the biggest science issue in your state coming up this election week. You’ve been voting already. What issues are on the ballot? What issues are affecting not just your state or your county but local communities? People are going to be voting for their local officials. Plus, some contenders from– well, we’ll talk about them. From net neutrality in Nebraska to opioid abuse in Kentucky. It was just announced today, opioid deaths are at an all time high. So we’ll be back after this break. Stay with us. Our number is– Let me give you the number before we go, 844-724-8255. We’ll be right back. Marine animals use coral reefs sounds to find suitable habitat. Researchers have collected the sounds of a group of narwhals in order to monitor how the animals are affected by manmade sounds.